Learn about Northumberland, England by reading A Trip into the Past by Sandy Zimmerman, Travel Writer. It features a mini, but thorough tour of the destination, plus all you'll need to know to plan your trip including getting there, objective information on places to stay and eat, and things to do. At the end of the article, we've provided a summary of the contact information for your easy reference. Enjoy! The unspoiled feeling of Northumberland is mixed with the thrills of visiting castles and other ancient Roman ruins. If you want to get away from the crowds, to be one with nature, the perfect vacation is Northumberland, England. Northumberland has more castles on the border than anywhere in the world. There are so many surprises when you explore Northumberland’s 4,000 year history. 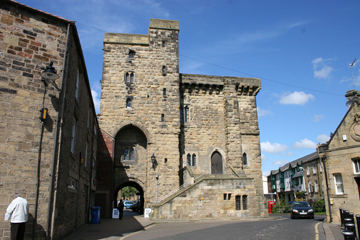 Northumberland is described as “England as it used to be.” Visitors have so much to see in this region, especially the Dark Ages Abbey town of Hexam. You will see crosses from the Dark Ages, eighth century and other relics. Alnwick Castle located in Northumberland, was built immediately following the Norman Conquest, and has been renovated and remodeled a number of times. It is the second largest inhabited castle in England after Windsor Castle and is open to the public throughout the summer. This castle was used as a stand-in for the exterior and interior of Hogwarts in the Harry Potter films. According to the Northumberland National Park (www.northumberlandnationalpark.org.uk), “Hadrian’s Wall (http://hadrianswallcountry.co.uk) is the most important structure in Britain built by the Romans, and is the best-known frontier in the entire Roman Empire”. The wall, which began to be built in AD 122, was built to prevent military raids on Roman Britain from the north, to improve economic stability, to provide peaceful conditions in Britain, and to physically mark the frontier of the Empire. It is also thought that the gates through the wall would have served as customs posts to allow trade taxation. 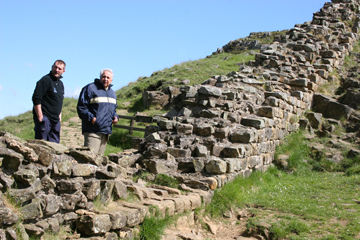 The experience means so much more when you realize that much of Hadrian’s Wall is still intact after 2,000 years. Hadrian’s Wall was named a World Heritage Site in 1987. In 2005, it became part of the larger "Frontiers of the Roman Empire" World Heritage Site, which also includes sites in Germany. The wall winds up hills and around the bogs, running 84 miles coast-to-coast along the national trail. Housestead’s Roman fort is located along Hadrian’s Wall and is the most complete example of a Roman fort in Britain. Four landmark English Heritage Sites dot the wall. So popular is this historic attraction, the Hadrian’s Wall bus runs daily through the summer. Daily trains are scheduled to Hexam with bus connections. Choose from 40 walks and cycle routes of the towns around Hadrian’s Wall and into the country (http://www.nationaltrail.co.uk/hadrians-wall-path http://www.hillwalktours.com/hiking-england/hadrians-wall-path-overview). Close to the Scottish border and a stone’s throw from Hadrian’s Wall, we were brought to Battlesteads Country Inn and Restaurant (www.battlesteads.com) for lunch. Built in 1747 as a farmhouse, the Inn was a part of the village’s more recent history. The owner, Richard Slade recounted stories of the Reivers, the Anglo-Scottish border raiders who robbed cattle ranches from the 13th to the 17th century. It was a lawless time when the people were constantly alert, watching for the raiders. England and Scotland both had their own Reivers who robbed from Edinburgh to Yorkshire. The frontiersmen built fortified tower houses for defense with a large place to keep their cattle in the basement and the house above. 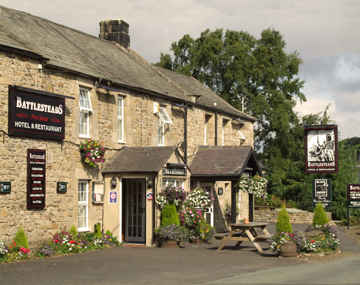 Battlesteads is a four-star inn with a reputation for great food and efforts to preserve the environment. Richard installed a wood chip-burning biomass boiler system which provides heating and water for the entire building along with solar panels. They won the Gold Award for Green Tourism and were named “One of the Top 20 Gourmet Inns of the UK” (2008). For a restaurant in a small village, Battlesteads is amazing—offering several international menus. They purchase the freshest local ingredients from within a 50 mile radius. I especially enjoyed their wide variety of mushrooms, some of which were over 2” long! The last word in elegance and luxury in a classical setting, the De Vere Slaley Hall Hotel stands proudly as a monument to the past. The building’s embattled wall and architecture resembles a castle. It began as a stately mansion built by Charles Samuel Hunting, in 1912, as his family home. They employed a housekeeper, five maids, butler, footman, cook, two kitchen staff, seven gardeners, three chauffeurs, game keeper, forester and family of six who ran the home farm. In 1984, Slaley was sold and has remained unchanged throughout the years, except for adding a wing. At Slaley Hall, everything is orchestrated for the guest’s enjoyment and comfort. The chef is totally committed to source the best produce and livestock from small, local Northumberland farms which do not use pesticides; some are organic and have the highest standards in quality. They visit the farm to see how the animals are reared and treated. Everything is fresh from a 30 mile radius. Slaley Hall’s philosophy – this is the life – is what they want guests to feel when they are there. Duke’s Grill, in a classic Edwardian drawing room, uses a special Josper charcoal grill with a very intense heat to seal in the flavor. Steaks quickly retain all of their moisture and tenderness. The waiter wheels the antique silver trolley to the table and carves the aged sirloin roast. In contrast, the Claret Jug Restaurant is rustic with serving chopping boards, platters, share plates and cast iron dishes. They offer different flavors and tastes that you do not usually find. With 1,000 acres of forest and moorland, Slaley offers many settings for weddings, parties and business conferences. They arrange Casino Nights, Viking Nights, Bedouin Tents, Medieval themes and just about everything! A bride can arrive by helicopter or she and the groom can be whisked away by helicopter after the wedding. The grounds sparkle with lights at night and the Northumberland pipes are played during the event. When guests are celebrating their anniversary or special occasion, they prepare a candlelight dinner outside at the Japanese Gardens as a surprise. The invitation is presented to them in their room. The lawn becomes a stage for summer outdoor performances of the “Merchant of Venice,” “Wizard of Oz,” “Peter Pan” and other shows. Guests are away from the cities, yet they have everything here: Driving range, two championship golf courses, 4X4 adventures, indoor pool, archery, clay pigeon shooting, paint balls, mountain biking, and hot air ballooning. Take a self-guided tour map suggesting easy walks. You may not have heard of the DeVere Slaley Hall Hotel and Northumberland but if you visit, you will never forget them!!! BMI schedules direct and daily connecting flights from the United States. Notice: This information is current as of November 2008. It is recommended that you contact the numbers, and/or visit the websites above to determine any changes to the information.